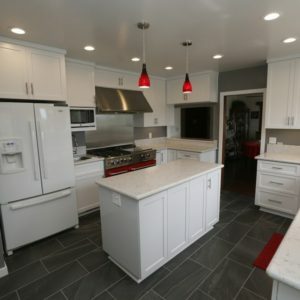 When undertaking a major project such as Kitchen remodeling in Newport Beach CA, it’s really important to have the right contractor on the job. At Cabinet Magic, we believe we are that right contractor. As a licensed contractor, we can take you through every phase of the project with ease, from the initial design planning to sourcing the best designer materials–including custom cabinetry–to installing and finishing everything to a high standard. Kitchen remodeling in Newport Beach CA sometimes requires a leap of faith as you go from your sample selections to the real thing. What if the finished design doesn’t turn out like you expected? At Cabinet Magic, we understand how important having an accurate visualization of the finished kitchen remodeling in Newport Beach CA is for your comfort and peace of mind. That’s why we always bring proposed kitchen designs to life using 3D rendering software. You’ll be able to see and approve all aspects of the design down to the last detail before we begin work. Custom cabinetry can take your kitchen remodel to a whole new level. You’ll be able to maximize your storage space while also incorporating the features you want and the style you need to integrate seamlessly with your overall interior design. At Cabinet Magic, we have almost 30 years of experience in crafting custom cabinetry. We can custom fabricate any size cabinets with any combination of doors, drawers, roll outs, racks, and other storage accessories, and of course you will have your choice of styles and finishes. We are true perfectionists and we take great pride in delivering quality cabinetry that lasts. Would you like more information about working with Cabinet Magic on your kitchen remodeling in Newport Beach CA? Call us at 800-828-4380 or contact us online to schedule a free in home consultation. We can help you price the upgrades you want and give you a free estimate.